The bank set aside another $1.3 billion in the quarter to cover future loan losses as the housing market and the economy worsen. JPMorgan said it would also take a charge of about $540 million to cover the first wave of losses and litigation costs related to its acquisition of a rival bank Bear Stearns in March. So far, JPMorgan has weathered the tight credit market better than most of its peers, though its shares have been battered along with the rest of the financial sector. But as confidence rebounded on Wednesday, JPMorgan shares jumped 15.86 percent as nearly all bank stocks rallied. Still, the rising number of defaults in mortgages, home equity loans and credit cards suggested that the worst was not over. Chase, the bank’s big consumer arm, set aside $3.8 billion in reserves, about twice the amount from the previous year, to cushion its expected losses. Yet it caters to some of the industry’s most creditworthy borrowers. Although the bank is widely praised for its strong balance sheet and management under its chief executive, James Dimon, Thursday’s results show that it is not immune to economic and competitive pressure. The bank loosened lending standards and was caught off-guard by the severe downturn in home prices along with many of its rivals. And Mr. Dimon cautioned that conditions could get worse. Net income fell more than half to $2 billion, or 54 cents a share, compared with $4.2 billion, or $1.20 share, a year earlier. Analysts surveyed by Thomson Financial had expected 44 cents share. Revenue dipped 1 percent, to $19.7 billion. The second quarter was difficult for JPMorgan, with challenges in each of the bank’s six main businesses on top of the Bear Stearns acquisition. 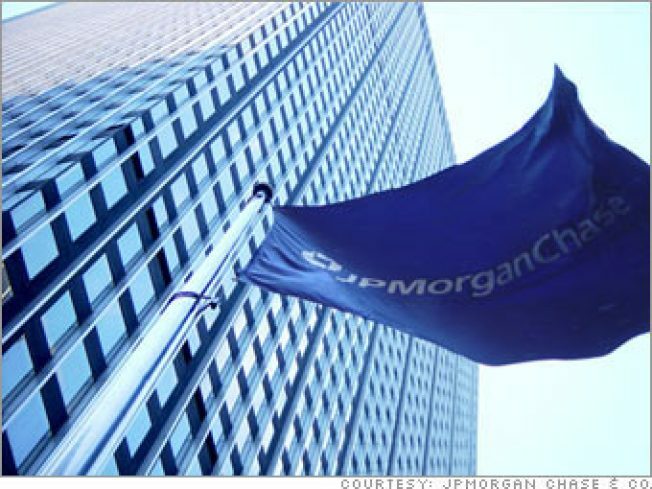 JPMorgan took about a $540 million charge to reflect losses from about a two-month period ended May 30. But that was partially offset by a gain on the sale of MasterCard shares, which been among the industry’s highest flyers. The finance chief, Michael J. Cavanagh, said the bank expected to take a total charge “a touch higher” than the $9 billion to clean up Bear Stearn’s balance sheet and pay for litigation and other merger expenses. JPMorgan scooped up the investment bank two months earlier, when Bear Stearns was pushed into its arms to avoid the possibility of bankruptcy and widespread financial panic. The Federal Reserve helped engineer the takeover by guaranteeing a $29 billion loan to facilitate the transaction. Still, the bank raised about $6 billion in fresh capital that insiders say could be used to plug the losses. Others suggested it could be to add provide layer of protection for its “fortress balance sheet” — or perhaps another acquisition. Mr. Dimon and his lieutenants have been eyeing troubled retail banks for months, and most analysts believe he is searching for another deal. The commercial bank and treasury services division delivered record revenue and earnings in the second quarter from double-digit growth in loans and deposits. But its much larger consumer franchise and investment bank faced another tougher quarter as the downfall amid highly volatile markets. Investment banking profit swung to a $785 million loss, dropping 67 percent after it wrote down $1.1 billion in unsold buyout loans and complex mortgage related securities. Trading revenue was weak in both the equities and fixed income division despite some brighter spots in currency, emerging markets, interest rates units. The bank also highlighted its commodities trading business, currently the hottest area of the markets. But investment banking fees were the second highest ever as its participation in several big fund-raising efforts buffeted from the industrywide decline in deal-making. Chase Card Services, the bank’s big credit card arm, saw second-quarter profit fall 67 percent, to a $509 million loss as charge-offs continued rising. Its loss rate climbed to about 5 percent in the second quarter. Mr. Dimon warned in May that charge-offs could top 6 percent in 2009. Many of the losses were concentrated in areas where home values fell the most. But the problems are spreading. Chase Retail Services, the bank’s consumer unit, reported a $179 million loss after a 23 percent drop in profit. The division was mired by losses on home equity loans as well as mortgages as more borrowers stopped making their monthly payments. Chase’s auto finance arm also experienced higher loan losses, as more consumers find their budgets stretched by higher gas and food prices. The asset management division booked a $395 million profit, down 20 percent from last year, despite a large influx of new money. Revenue of $2.1 billion was down 3 percent because of lower performance. Investors on Wednesday cheered the results of other banks, whose earnings were bad but not as bad as they anticipated. Despite mixed economic news, financial stocks posted their biggest-gain ever, following a big drop in oil prices and Wells Fargo’s better-than-expected earnings. The Standard & Poor’s 500 Financials Index rose 12 percent, with every bank stock trading at least 10 percent higher. Wells Fargo said its second-quarter profit fell 23 percent as quadrupled the amount it set aside for credit losses. Nevertheless, its shares soared nearly 33 percent when the bank, in a show of its financial strength, announced it would raise its dividend. State Street, a trust bank, and First Horizon, a Midwest regional lender, also reported better-than-expected earnings. Merrill Lynch reports its earnings after Thursday’s market close, followed by Citigroup on Friday. The Wachovia Corporation and Bank of America report their results next week. The investment management firm BlackRock said on Thursday said that its profit rose 23 percent in the second quarter on a sharp increase in assets under management, including deals to liquidate troubled investment portfolios for others. BlackRock reported net income of $274.1 million, or $2.05 a share, compared with $222.2 million or $1.69 a share a year earlier. Revenue rose to $1.39 billion from $1.10 billion a year earlier. Analysts polled by Thomson Financial expected earnings per share of $1.97 for the quarter on revenue of $1.32 billion. BlackRock said assets under management rose 5 percent in the quarter to $1.43 trillion. The firm has been tapped by the Federal Reserve to manage and liquidate a portfolio of Bear Stearns securities, among other such deals.